This mission is the 2nd mission of the Iron Challenge Longtooth Mission Chain added to the set of Iron Challenge Missions in Planet Calypso Content Release 2010.03. The objective of this mission is to kill 250 Longtooth. CFA hosts a series of Iron Challenges. 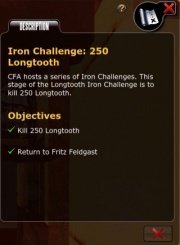 This stage of the Longtooth Iron Challenge is to kill 250 Longtooth. 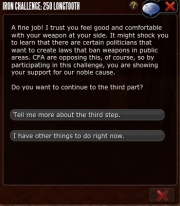 Upon completion (clicking "Tell me more about the third step") you will be automatically rewarded 1 point of Strength. This page was last modified on 31 March 2017, at 11:35.